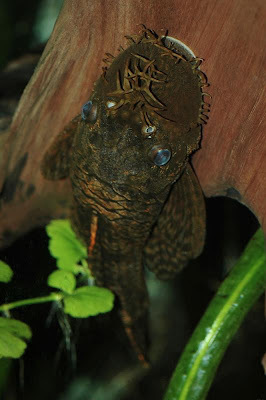 The Bristlenose Fish or Ancistrus lineolatus is one ugly fish! From the Catfish family this fish has strange whisker-like growths coming out of the top and sides of their head. This freshwater fish is a fairly popular aquarium fish due to this rather strange appearance. If you do purchase this fish though, you might not see them too often during the day. They do like to hide from the light and will normally only come out when being fed or at night. Bristlenose Fish prefer a tank that has plenty of places to hide and lots of plant life. The feed on worms, brine shrimp and spinach. The Bristlenose fish is a very peaceful fish, but if you get two males together they will attack each other. These type of fish can well over 8 years old. They originate from the Amazon River area in South America.